Dreamporte is a non-profit organisation set up to help bring the wonders of the world to underprivileged children. But they need help to achieve their goal: your 360 degree or 3D videos. We asked co-founder of the project, Kelly Zhang, to tell us what Dreamporte is and why it matters. The power to transport your mind to other places is the most potent property of virtual reality. And whilst the logical focus right now is primarily on entertainment, VR’s potential is nearly limitless. We’ve already seen educational startups like the Comenius Project demonstrate the power of engaging students in potentially difficult subjects through the use of the Oculus Rift and Leap Motion. Currently, 45% of children in the US live in low-income families, and 30% of American kids live in single- or no-parent households, in which they often lack the resources to succeed in school, aim for better outcomes in life, or even leave their immediate neighbourhoods. Studies have shown the benefits of extracurricular mentorship programs in improving the outcomes of disadvantaged youth; we’re taking this one step further by implementing innovative technology to engage the students. 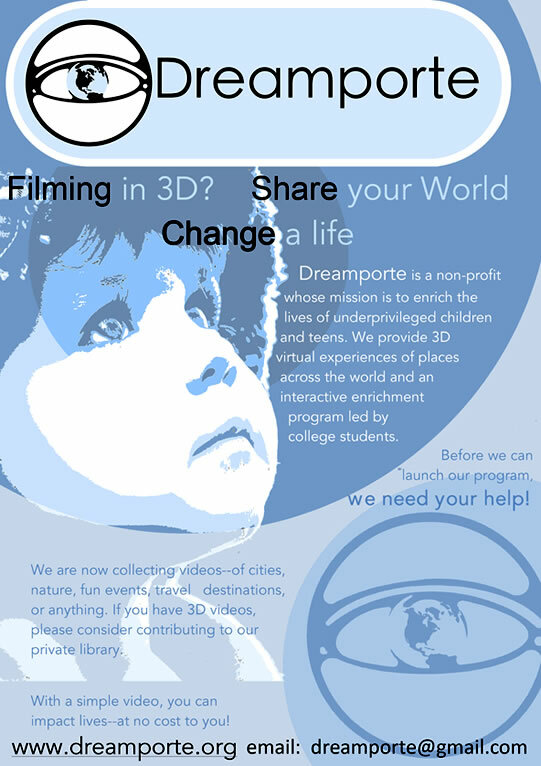 Founded by Harvard undergraduates, Dreamporte is a non-profit organization whose mission is to enrich the lives of disadvantaged children and teens. We provide unique 3D virtual experiences of places across the world with related activities led by college student mentors. Our programs aim to enhance their understandings of the world, surround them with role models, and inspire them to dream big. We asked co-founder of the project, Harvard University sophomore Kelly Zhang, to tell us why this project is important and what drove her to create Dreamporte. The inspiration for Dreamporte came from my desire to share the opportunities I’ve been lucky enough to have with others. This summer, I learned a good deal about the Oculus Rift, particularly through meeting Oculus’ VP of Engineering, Jack McCauley. During a casual dinner conversation, someone mentioned that one day people will be able to “vacation” to Hawaii or Paris from their front porch. To be honest, I was initially skeptical. While I thought it was really cool technology, how can anyone compare an unforgettable afternoon on the beach to wearing a clunky pair of goggles? However, my outlook started changing as I began thinking about the potential for virtual reality to bring travel experiences to people who may not have the means to travel themselves. One particularly transformative moment occurred when I was speaking to a director of a non-profit that works with disadvantaged youth in Boston. She told me how one year there was a donor who donated enough money for eight fifth-graders to go to Disney World. While this was a touching act, the shocking part was that half of these children had never even heard of Disney World. This really opened my eyes to the fact that there are experiences that were important to my personal and intellectual growth—such as witnessing a different culture in Mexico, learning about American history in DC, visiting family in China, etc.—that many kids cannot even imagine having. With this spark of motivation, Dreamporte began coming together. I gathered friends from Harvard, who are passionate about both technology and education, to form the core team. Now, we are determined to create a college-student-run educational program that allows underprivileged youth to discover places and cultures from around the world. For our pilot program, we are extremely excited to begin working with a group of middle and high school foster students starting in February, 2015. For our program, we are collecting videos from different sources and using virtual reality players, such as MaxVR, to play the videos through the Rift. During our program, Dreamporte volunteers will lead hands-on cultural activities and students will be able to take turns to “visit” the destinations on the Rift. The videos would be from destinations around the world, shedding light on the scenery, culture, or history of the location. They would be either spherical or 3D so that the VR experience would be more immersive than simply viewing a video on a computer screen. For each video source, our tech managers keep track of the optimal settings for playback on the VR program; so far the spherical or 3D videos we’ve tested from our first contributors—Dryft, PanoCam3D, and several YouTube users—have worked on MaxVR, despite being filmed with different methods. Right now is a really crucial time for us because we’re building the curriculum and would love to have access to as many videos from around the globe as possible. Overall, I feel incredibly fortunate and excited to help pioneer the intersection of technology and education, but one of the biggest lessons I’ve learned is that it really does take a village. I couldn’t be more thankful for my friends, mentors from both Harvard and home, and videographers and supporters in the VR community, that will make Dreamporte a reality. Our thanks to Kelly for sharing her thoughts on the project. If you’d like to help, head here to share your videos with the team. We’ll check back in with the Dreamporte team soon to see how the project progresses.